Welcome to the Anatomy of A Bong 101. Class is now in session. The anatomy of a bong is varied and more complex than one might think. 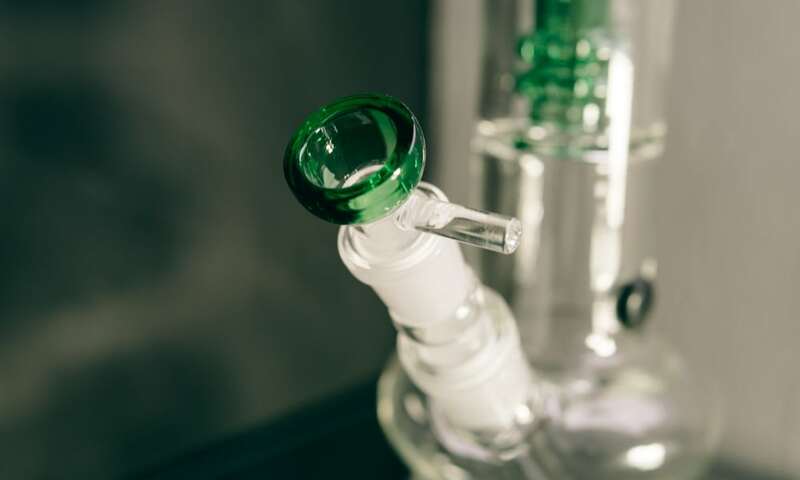 Bongs come in many shapes and sizes, but there are some features that you can expect to find on most pieces. Bongs set themselves apart as a cannabis smoking apparatus because they have one or more chambers with water to filter and cool smoke. Bongs can be made of wood, acrylic, soft glass, borosilicate, silicone, metal, and other materials. Most bongs, however, are made of glass and consist of several components, as opposed to bowls, which are typically all-in-one. As a result, there are several more pieces of glass to worry about. We’ll go over the anatomy of a bong to give you a better understanding of all the components and their individual functions. From weed to inhaled smoke, smoking a bong starts at the bowl piece. The bowl is where you pack your weed after it has been through a grinder or broken down. Bowls come in several shapes and sizes, but often it is just a “push” or glass indent with a hole at the bottom. Some are just for aesthetics, while others have functional purposes. Many newer bowls have built-in glass screens, eliminating the need for smoking through thin-wired metal screens that need to be replaced often. There are several different styles of built-in screens with various-sized holes to suit your preference. If you don’t want anything making it past the bowl, go with a smaller hole screen, like the honey-comb style. With a name like ash catcher, the function is a dead giveaway. You guessed it—an ash catcher is a glass attachment that catches ash. They catch the ash from your bowl when it sinks through the hole. This prevents ash from getting into your bong, and then potentially your mouth. Despite the name’s focus on that one function, ash catchers are useful for other reasons. Some ash catchers come with built-in percolators to further filter and cool the smoke. Additionally, ash catchers will accumulate most of the tar and gunk from regular use before your bong does. They’re much easier to clean than the whole bong, and when you do, you won’t have to clean a bong as often as you normally would to keep the flavor and function on point. The part of the bong that holds your down stem is called a joint. There is also a joint at the end of all down stems. Some bongs have a fixed stem with no removable down stem. In those cases, the bowl goes straight into the joint of the bong. Joints generally come in three sizes: 10mm, 14mm and 18mm size holes. For smoking weed, you’re going to want to make sure the joints are female and not male. Female joints allow the male jointed bowl piece, stem or ash catcher to be inserted instead of wrapping around the joint. Male joints became popular for designated dab rigs that use domes and nails. One of the most important parts of the anatomy of a bong is the down stem. The down stem is the bridge between the bowl and the water in the main chamber of your bong. At the end closer to the joint, there should be a 10, 14 or 18mm sized hole. Down stems come in many different styles with various functions. The most basic down stem is just a glass straw with a hole at the end to cause bubbling. However, there are far more intricate down stems with their own built-in percolators to further cool smoke. For glass bongs, we recommend using a plastic clip to keep the down stem fixed to your bong. It’ll make it easier to clear a bowl. We’ve seen many stems come out along with the bowl once things get gunked up. Then, the stem can fall and break—if it didn’t snap on the way out of the bong. Some lower-end bongs have the down stem and bowl all in one piece, and refer to them as slides. The percolator is used to filter the smoke additional times after it passes the water at the end of your stem. There are so many different types of percolators out there, it’s hard to tell which is the best without an idea of your individual needs. Avoid tons of tiny small holes if you’re not a regular bong cleaner. Eventually, the holes will get clogged up, negatively impacting the performance of your bong. A splash guard is a feature found usually in some bongs with heavy percolation. As the name suggests, its purpose is to prevent the water bubbling upwards from getting through the mouthpiece. Splash guards come in different shapes. Before there were splash guards, the only thing you’d find close to the mouthpiece of a bong was the ice pinch. Three spikes of glass come to hold ice. This cools the air before it reaches the mouthpiece. Now there are better splash guards that look like dome percolators right below the mouthpiece. For some bongs, a bent neck acts as an additional splashguard, making it harder for water to travel up and out of the mouthpiece. The final stop the smoke has to make before arriving at your lungs is the mouthpiece. Traditionally, mouthpieces were horizontal, at the highest point of the bong. Now, you can find bent-neck bongs with angled mouthpieces allowing you to get a hit without having to hunch over the bong. Now that you know all of the individual parts of the anatomy of a bong, you’ll know what you’re looking at when browsing the shelves of a smoke shop. Understanding the functions of each part should help when choosing between two similarly priced pieces. If you feel like your current bong is too harsh, you can get an ash catcher with a built-in percolator to help make hits smoother. If your weed sinks into the bowl before it’s all smoked, it’s time for an ash catcher, and perhaps a bowl with a smaller hole or built-in screen. Regular bong smokers, whether smoking flower or moonrocks, should use a glass bong because they’re better-tasting and easier to clean. However, if you are clumsy, you should follow our tips to avoid destroying your bong.